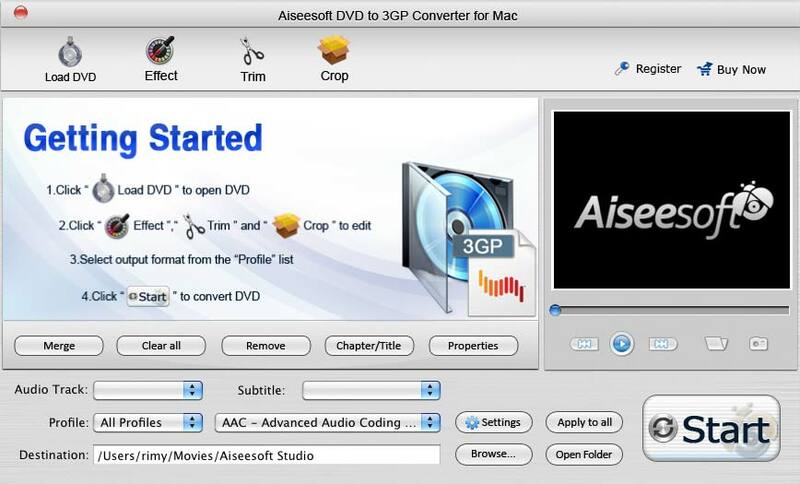 Aiseesoft DVD to 3GP Converter for Mac is all in one yet very easy to use and the best Mac DVD to 3GP converter for Mac users to convert DVD to 3GP Video format for playback on cell phones. Designed just for Mac PowerPC and Mac Intel users (including Mac OS X 10.5 Leopard), Aiseesoft DVD to 3GP Converter for Mac can also easily convert DVD to AAC, MP3, WAV audio format with excellent sound quality. With Mac DVD to 3GP converter you can change parameters of Video Encoder, Resolution, Frame Rate, Video Bitrate and Audio Encoder, Sample Rate, Channels, Audio Bitrate according to personal need. You can also input Video Resolution in the form of Width (pixels)*Height (pixels) and save all the settings as user-defined profile. Trim any time length clips of any title or chapter to get your favorite segment only with Aiseesoft DVD to 3GP Converter for Mac. Crop DVD video to remove the video sides and get your ideal effect suitable for different players. To add watermark to have a more colorful music life. Convert DVD to 3GP for Mac with any available subtitle and audio track you prefer. This Mac DVD to 3GP software can convert all the selected titles or chapters into one file. Qweas is providing links to Aiseesoft DVD to 3GP Converter for Mac 3.2.08 as a courtesy, and makes no representations regarding Aiseesoft DVD to 3GP Converter for Mac or any other applications or any information related thereto. Any questions, complaints or claims regarding this application Aiseesoft DVD to 3GP Converter for Mac 3.2.08 must be directed to the appropriate software vendor. You may click the publisher link of Aiseesoft DVD to 3GP Converter for Mac on the top of this page to get more details about the vendor.